Of course, Etsy’s not just for badges, magnets, keyrings and the like – all sorts of lovely handmade items are sold on the platform. It’s got loads of benefits, as it’s easy to set up a shop and is probably the most well-known marketplace. But for that same reason, some people look elsewhere to sell their crafts, as the large amount of listings can make it hard to compete. Etsy alternatives are increasingly common, particularly as the market for handmade crafts continues to grow. Although we’ve looked at some of the more well-known places to sell crafts online before, this time, we’ve tracked down some of the best, niche sites like Etsy that are available to UK users, and that you might not have heard of! What Are Some Alternatives to Etsy? Coriandr is a much smaller Etsy alternative. This isn’t necessarily a bad thing, as it’s considerably cheaper. Whereas Etsy costs 20 cents per listing plus 3.5% commission, Coriandr charges 20 pence per listing plus 2.5% commission on all sales, which you’ll get a monthly bill for. It looks very basic, but the plus-side is it’s easy to set up, and once you do have a shop, you also get a unique shop URL. On Coriandr, you can sell ‘anything handmade and creative’, and their categories contain craft favourites like needlecraft, candles, jewellery and many more. Although there aren’t that many listings on the site, this gives you the opportunity to stand out from the crowd! 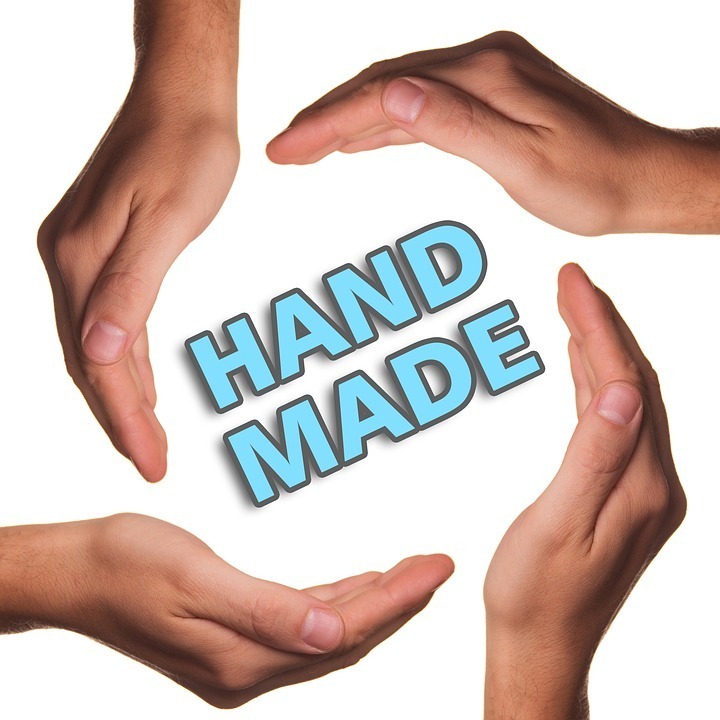 For a site like Etsy that really focuses on quality, look no further than Madebyhandonline. This site, founded in 2010, handpicks around 120 crafters and designers to represent, and they only pick the best of the best. In fact, they don’t even refer to themselves as a marketplace, but as a ‘curated contemporary craft shop’! This emphasis on exclusivity really shows though, as the products listed here truly are beautifully designed. From jewellery and fashion through to textiles and ceramics, there’s a broad range of top-quality handmade goods here. We were particularly pleased to see some handmade badges on their store! The Crafters’ Barn is a much smaller site than any others here, set up in 2011. It’s really focused on the crafting community, and as such has commission-free selling. There’s a £2.30 monthly fee, but this entitles you to unlimited listings. Like Madebyhandonline, this is an Etsy alternative that focuses on quality, carefully curated items. Founded in 2010, with SwankyMaison the first year is free, but they do take a rather sizeable 30% commission. On the plus side, the careful curation means as a seller you’ll be in great company. They’ve specifically ensured that their categories don’t become too crowded, so there’s good opportunity to let your products shine – which, if you didn’t have much luck on Etsy, could be a breath of fresh air! There’s plenty of sites like Etsy out there, you just may not have been aware of them! Hopefully this article has given you some new inspiration!